You are here: Home / News / A Flexible iPhone. Fact or Fiction? 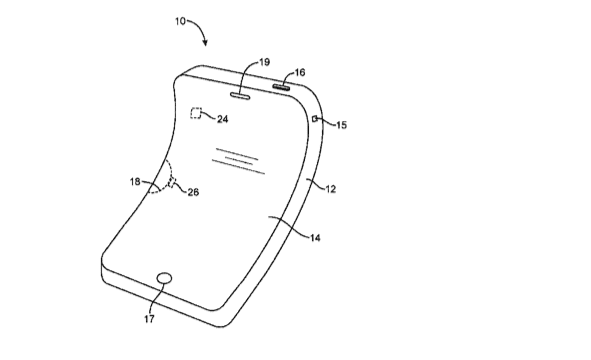 As Apple gets closer to releasing new iPhones, you can get a sense of some of the potential features by looking closely at the patents that are approved in the months preceding the release of the device. 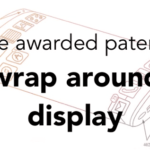 Not all patents make it to a new product but when you see start seeing a new idea across multiple patents and over the years, you begin to wonder if this new idea has momentum. 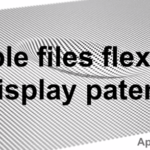 There has been quite a bit of chatter around flexible displays for the last few years. 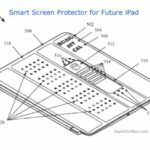 A patent that was finally approved today shows some of the latest thinking around how Apple may choose to introduce this feature. This patent, 9,557,874 was recently filed in Feb 2016. The art and science of making flexible display smartphones is not that straight forward. It does look pretty darn impressive on those concept videos out there but could take a lot of effort on the part of the company planning to launch this. Not only do you have challenges from a material science perspective, but there are also core-engineering hurdles that need serious thinking. Marketing such a new and innovative product may not be very tricky but the existing supply chain will need some serious overhauling so as to keep up with the new changes to produce enough products to meet the consumer demand. When we think flexible, we usually associate it with the flexible display. It is just not the display of the iPhone that needs to be flexible. In order for a flexible form factor to truly work, engineering has to think about a flexible housing that is stable, a circuit board base that is made flexible, internal components that are flexible, using air or fluid to allow the display structure to be flexible as well as a battery that is flexible. As you can see this is not a small feat and will require replacing more than a handful of internal components and casing structures for the current iPhone . That’s just on the hardware side of things! Now, Apple is always known to imagine the unimaginable. You can see some of this crazy thinking in a patent that was approved in Jan 2015. 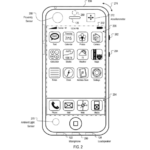 Patent # 20150011248 was titled “mobile device with an adaptively responsive display”. 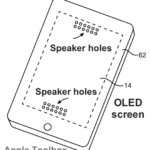 It focused on how various software functions can be triggered based on the flexing motion the iPhone. It also covered a new way of understanding gestures on a flexible display device. So Now you have hardware challenges that also require some serious software finesse to really make the “flexible” adjective stand out. 2014 was a busy year for the genesis of flexible display units. At least 6 patents were approved between January and August of that year. 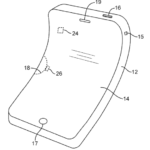 Some covered methods of reducing the border area of the iPhone while others focused on how to handle pressure signals through flexible display and introduced thinking around foldable devices. This new patent, approved today gets into details around how a flexible housing structure system can be developed. 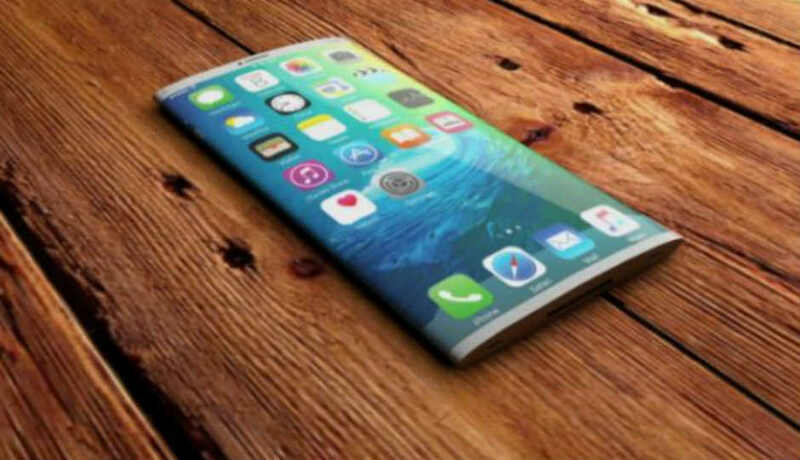 Although new OLED display screens can be made flexible, the housing structure to hold the screen needs more engineering thinking in order to make the entire device flexible. Flexible housing members may include configurable internal support structures that have flexible and rigid configurations. 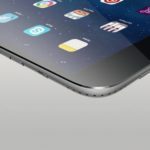 Ultimately, by making the device flexible, Apple can develop devices that are foldable and that could be a game changer when it comes to overhauling the lack luster upgrade cycle that the company is experiencing. 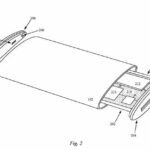 Now, if the thinking around Flexible displays was just science fiction, Apple wouldn’t be busy with its drawing boards for the past four years. It takes courage to innovate and it takes a solid team to buy into that vision and then execute on the changes in order to bring the new product to the market and deliver on superior customer satisfaction. Earnings this quarter have proven that Apple can step up to challenges and deliver solidly. Hoping to get a flexible iPhone for the 10th anniversary may be a little too optimistic. As long as the tinkering around this idea continues at 1 Cupertino drive, As an Apple Fan, I feel pretty darn good abut my prospects.